A variety of river trips from 1/2-day to multi-day expeditions. Calm water scenic cruises to class V big white water. Offered mid-March to early November. Pick your poison and find a variety of tour offerings and excursion packages by kayak, canoe, jeep or raft. Keeping things extreme! Call Coyote Shuttles for all of your touring transportation needs and enjoy the excitement of this unique travel experience. Service areas from or to Moab, Utah connecting to all cities within a 250 mile radius as well as regional airports, bus stations and train stations. Offering all things adventure with 100+ air, water and land tour options throughout Utah, lodging recommendations available. 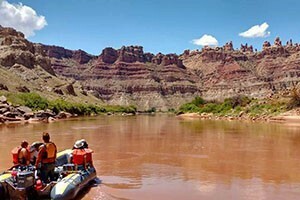 People of all ages and physical abilities choose jet boats because they want to experience the thrill of the Colorado River without getting wet, as they would with whitewater rafting or kayaking. Yet, just because riders stay dry, doesn't mean they'll have less of an adventure. Jet boats are designed to seat small to medium sized groups and the cruising speed averages around 25 miles per hour. Typically the boats are made of aluminum and have a shade awning over the seats to protect cruisers from the desert heat. Depending on the sightseeing cruise that you choose, you can expect to glide down the Colorado as the tour guide points out geological attractions or tells stories about the area's history. Packages vary from water only cruises to water and land tours, where the boat docks briefly for visitors to take short walks to destinations of interest, like natural arches and panoramic views. Half-day cruises start early in the morning and after lunch and run about four hours. Full-day cruises usually include lunch. Most tour companies offer discount rates for children or if you combine your cruise with other packages they offer. If special physical needs are a concern, contact the tour company in advance to make accommodations.